My week of exploring Denmark continued on Wednesday. Our plan was to go to Skagen, the northernmost point of Denmark, and then to Ålborg on the way back. The journey lasted five hours and we had to change train twice. The last train is operated by a private company, so our InterRail tickets were useless for that. 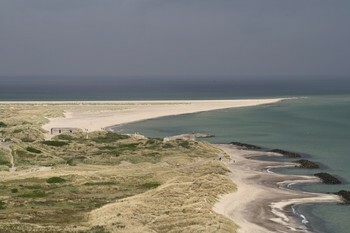 We planned to arrive to Skagen, take a bus to the mentioned point of interest and then go back. Unfortunately, there was a typical Danish surprise – the buses are going only in summer time (no comment). So instead of sparing time by taking a bus, we walked over four kilometres to get there. On the way we stopped at the old lighthouse and climbed all its stairs up. The view was beautiful, you can see a lot of pictures in the gallery. I reserved this week to explore interesting places in Denmark. The next destination was Fynske Landsby. 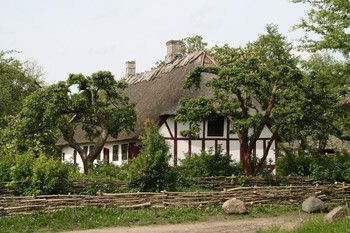 It is a skanzen (open-air museum) situated not far from the Odense centre. I had two free tickets from the Odense municipality, so we decided to go there. The museum is full of preserved historical buildings, most of them farms. Many buildings are nicely furnished to get you the idea, how the people lived. There are also many texts supplementing the decorations. The most interesting thing for me was the contrast between the houses of relatively wealthy farmer families and the houses, where servants lived. You can get the idea from the pictures in the gallery. It is easy to recognize, to which category the house belongs. 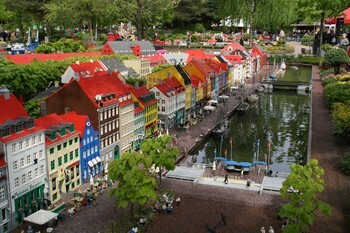 I could not be in Denmark without visiting the Legoland at least once. And I also liked to play with lego very much, when I was a child. On Tuesday me and Alina got up early morning and took a train to Vejle and then bus to Billund get there. The weather was quite good in the beginning and we were glad for that. After seeing many models, some of them amazing and magnificent, we started to enjoy the rides. In the park there are small and big roller coasters and many other smaller attractions like boat cruises, small trains, 4d cinema (that was really cool ) and water splash attractions. We left the latter for the end, because we did not want to walk around the park in wet clothes. Since we were in Denmark, it had to rain at least once per day like in a rain forest. After a while of walking in the rain we were wet anyway, so we did not mind at all being splashed. 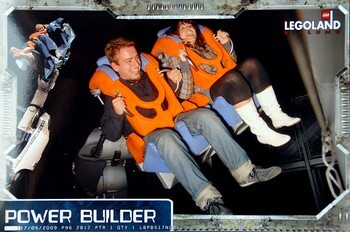 But before the water attractions we tried the attraction „Power Builder“, from which you can see the picture here. It worked really simple: you come, select „difficulty“ from wild to wildest, select some moves that a robotic arm should do with you and go to sit there and enjoy. We chose the wildest difficulty and selected the moves that seemed quite normal. After sitting we quickly realized that it maybe seemed normal on the screen, but in the real it was more crazy that we had imagined, so instead of screaming we laughed the whole time because of that surprise . If there had not been such long queue, we would have gone again for sure. We visited and tried everything and we went home. At first we were freezing at the bus stop, so it was really pleasing to sit inside the warm bus. We were very lucky with the train, fortunately we came to the platform in the same minute it arrived. Except the weather, I enjoyed the trip very much, it was worth seeing so many lego bricks and try the attractions. Last Friday I wanted to use one day of my InterRail ticket for Denmark. After some considerations I picked Helsingør like a target. I got up early morning and took the train to Copenhagen, where I needed to change to a regional train doing all the way to Helsingør and stopping everywhere. Fortunately, the whole journey took me less than three hours. After I got off the train, I went to see the city centre and buy something to eat. Since it was holiday, it was almost impossible to find some open shop there. The only shops open were the ones with wine and liquor because of the Swedish people taking the ferry and buying cheaper alcohol. They even accepted Swedish crowns . Anyway, in a while I found an open bakery and bought some sweet stuff. 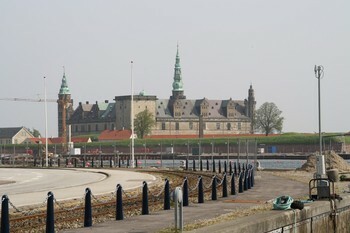 My next stop was the Kronborg castle. I bought the ticket and took two guided tours in English, one in the casemates (dungeon) and one in the castle chambers. I also went to see the chapel and fortifications around the castle. On the way back I stopped in Roskilde to visit my friends. I did not stay long, because I had a train to catch. It was a nice relaxing trip. The holiday in the Czech Republic were short, I wanted it to be longer. But I did not have to wait for long. In one week after I returned to Denmark, me and my friends headed together to Barcelona. We took a Ryanair flight from Århus to Girona. Everything went well, just the price 90 kr. for the airport bus was, like always in Denmark, very disappointing. After arriving to Girona we rented a car for one day. It took quite some time to overcome all the paperwork, but in the end we got the keys. 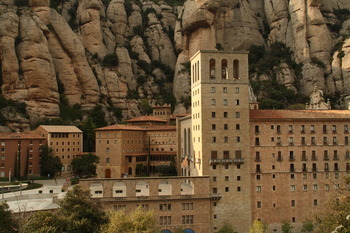 Our destination for the first day was Montserrat mountain and the monastery there. After some misunderstandings and swearing because of the dumb GPS, we found our way to the lower station of the train going uphill. The ride by the train was spectacular, very nice views along the whole way. On the top it was even more beautiful (just see the pictures), I don't understand how they could build something so big so high. We walked around the place for almost two hours. Unfortunately, we did not visit the museum, because it was closing when we arrived. When we had enough of great views, we took the train back down and went to Barcelona. The timing was the „best“ we could choose. We arrived to the city 15 minutes before a start of a Barcelona home football match. I have never seen so big traffic jam before. The funny thing was, that after the match started, the streets were totally empty, no cars, no people . Everybody was watching the match in the pub or at home. We found our hostel quite easily, put our things there and went to visit closest Burger King for a dinner . On the next day after waking up and having a big breakfast at the hostel we hit the streets. Our first destination was Camp Nou, the FC Barcelona stadium. I am not so big fan of football, but seeing the stadium for 100 000 people (more than half of Odense), was amazing. From the stadium we went to the Montjuïc hill to see a lot of parks, Olympic stadium and a castle. In order to see everything, we climbed the hill up and down like three times. I was quite exhausted after that. In the evening we moved to another hostel in the city centre. It was not so nice as the first one, but everything was in the walking distance from it. We reserved the third day to see the Gaudi's buildings. We saw lot of them and also visited La Pedrera (with its strange roof) and of course the famous Sagrada Familia. From there we moved to the Park Güell, the park that contains lot of Gaudi's buildings. Everything was really nice, including the weather, that was very warm. 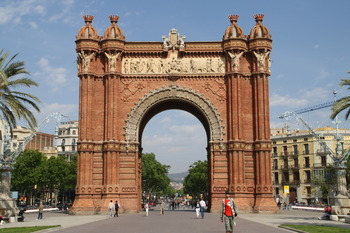 Desination for the last day was Arc de Triomf and the Old Town. We were quite tired of walking after previous days, so we just saw the most famous places (according to the guide) and went to the marina and beach. The temperature of the sea was not exactly for swimming, but we stayed on the beach for a while. When the weather started to be windy and cold, we went back to the centre and sat down to the pub. The rest of the time in Barcelona was just a long waiting for a bus to the airport. We did not have a hostel for that night, because the bus departed at 3.15. The journey back was full of waiting for something. Since midnight we were waiting at the bus station, but at quarter past one the security closed the lobby and we had to wait another two hours outside. Then we waited another two hours for the flight and then half an hour for the train to Odense. I arrived to my dormitory at 1 o'clock in the afternoon. Despite the complicated journey back, I liked the trip very much. 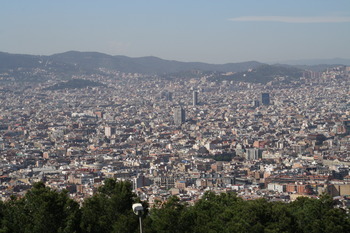 Barcelona is a great living city. For sure it was not my last visit there.